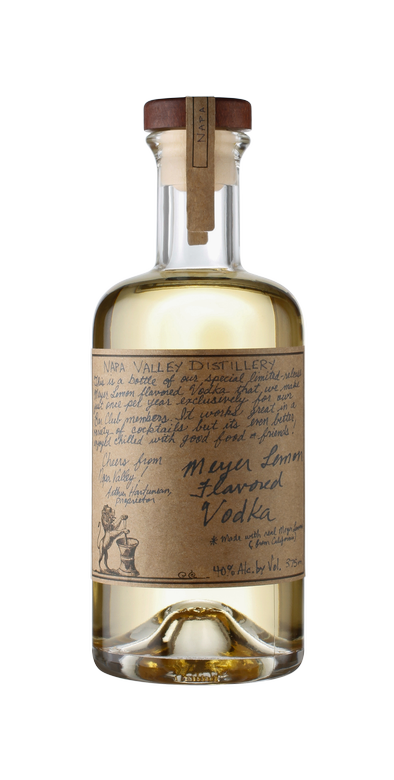 Napa Valley Distillery’s master blender and fearless leader, Arthur Hartunian, has fused the essence of two of our most popular spirits, Napa Reserve and Meyer Lemon Variety. The result is something even more spectacular: Meyer Lemon Vodka. It is naturally flavored with organic, hand-peeled Meyer lemon zest. Its richness and smoothness are reminiscent of our Napa Reserve, yet it’s subtle and elegant like our Meyer Lemon Variety. It is a truly unique spirit unto itself. This delicate sipper is first in a infinite line of our sipping Table Spirts, several of which will be released in 2017. Sipping or Table Spirits excite the palate with single natural flavors such as Ginger, Tarragon, or Dill and are meant to be enjoyed slightly chilled, neat, and paired with food. We suggest pairing our Meyer Lemon Vodka with a wide variety of scrum-diddily-umptious foods such as broiled salmon with tarragon, any assortment of smoked fish, deviled eggs, buratta and heirloom tomato salad, or wild rice salad. The pairing possibilities are endless. What is more exciting is that this rst batch is reserved exclusively for you, our loyal Club Members. ough we certainly plan on making more in 2018, this batch is yours! So drink up, and enjoy! …responsibly, of course. Really great! Really you have done a great job on this article. Information-rich contents.My goodness that I get this blog here on this site. Keep sharing in future. Great stuff! I really like the content that you have shared and want to say thanks to you for this great post. Thanks for sharing for knowledgeable information through this article. I really like to read this article. Thanks for sharing this post. Keep updating. Download AVG antivirus Installer using the direct links provided below. Includes AVG Free, Antivirus, Internet Security and PC Tuneup. How You Can Redeem Your McAfee Product Key and Get You Antivirus Activated In Few Easy steps. Quick Learn How You Can Use mcafee.com/activate to Activate McAfee using Product. Before finding a pg accommodation, you should need to get some opinions of people about the PG from that are currently living or have lived there previously. If it is going to be a shared space, contact your roommates as early as possible and start an enjoyable stay with them. Always keep in mind that socializing always comes in new places. Thank you for your kind comments. Of course you can share this on your blog. I would love to try this drink with my friends soon! Seems like I made an error.